The Victorian bustle dress outfit is beautiful. All that lace, ribbon, bows, fringe, pleated trim, ruffles, and frills galore! You want to wear one. But, you don’t know where to begin. It looks so complicated with all those layers. But, it is really not as complicated as it may seem. Here, Sue Woods will guide you through the 3 main bustle dress periods: the early bustle, the natural form bustle, and the late bustle. All have different shapes and elements that make up the looks and here, you will learn how to create each of them. You can learn about bustles dress era history and how to select the correct bustle pad before we get started. 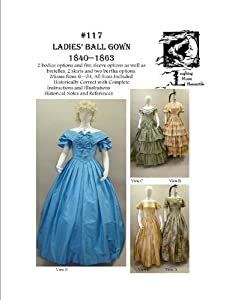 Jennifer Rosbrugh has a wonderful selection of suggested patterns you could use to make your bustle pad and petticoat for each of these periods and she goes into much more detail with the bustle dress style break down. I am going to suggest other patterns and things to look for, along with suggested items, if you wish to purchase a Victorian bustle dress by year. Jennifer has a wonderful video on how to sit in a bustle too. As mentioned in my article on the Victorian civil war era, you will need a corset, chemise, and drawers. You could use the same ones. Your boots and bag could work too. You will just need bustledress era specific hats and undergarments. Jennifer has some information about bustle era specific under garments here. Stick to cottons or other natural looking fabrics. But, for the bustle years, you can get more playful with colors and patterns. Small or large painted florals are always a safe fabric to choose for the era. Colors should be what is naturally found in a garden. Trims were used abundantly on bustle dresses. Although, less so for the late bustle. Before we go into the individual major styles, lets first start with items you will need that each of these bustle dress styles have in common. You will need a corset. A custom made corset will fit best but a ready made steel bone corset is fine to start out with. Here are several styles you can choose from. You may also like to get a chemise, drawers, or corset cover. Although, you can use items you may already have. A corset cover is optional. But, a good tank top can be your chemise (worn under the corset) and a nice pair of thin fabric shorts as your bottoms. I recommend wearing anything with a closed crotch over your corset, not under, for ease when using the facilities. Ladies’ shoes and boots of the bustle era from Survey of Historic Costume. Shop Victorian boots and shoes. The early bustle started to form during the later years of the civil war when a more elliptical hoop (instead of a rounded hoop) came into favor due to the rounded hoop becoming so big. It is said that the famed designer of the time, Charles Worth, didn’t really like the look of the rounded hoops as they began growing in width and circumference. His designs began to put more emphasis on the back end of dresses and he added draped over skirts. By 1868, we begin seeing what we would know as a bustle. The early bustle style lasted from 1864-75. So, how do you get yourself an 1870s bustle? Well, to start, Jennifer Rosbrugh has a video showing us how to create one. They are not too difficult to make with basic sewing skills. In a pinch, you could sue a large full skirt and gather the back into a bustle. Let us look at some options for early bustle specifiundergarmentsts. For this style, you will need a bustle cage. The early bustle shape was a more rounded one with an emphasis towards the back. Here is some information on them. You can purchase one on Etsy. Here is a bustle. Another distinction between this style and the bustle style of the 1880s, besides size, is where it comes out at. This more rounded rear end also seems to come out lower on the back, while the later bustle look seems to come out higher around the booty. Hats in the early bustle years were almost like mini hats or mini bonnets. You can use this pattern as inspiration for this style of hat. You can find similar styles on Vintage Dancer. Debbie has also used vintage 1950s hats for this era. They are usually small and when covered with some pretty flowers and lace will look perfect for this era (see her in the first picture). Shop Victorian style dress (all decades) or sewing patterns. By 1876, a new bustle shape was appearing. This shape was…well…flat. Sometimes a small pillow was worn under the back side of the skirts. But, not really much else. Trains were very popular during the natural form era. 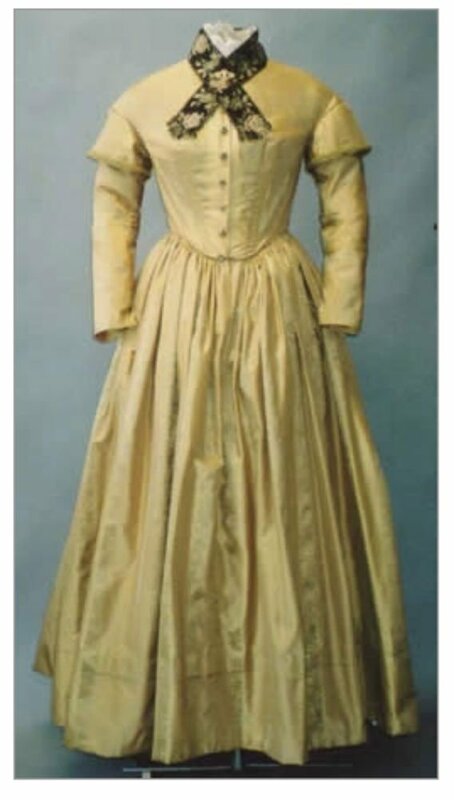 This era lasted until about 1878-83, with the years in between this and the previously mentioned bustle style being more of transitional years where you might have seen both or a combination of the styles. So, where can you purchase items in order to have a natural form bustle look? In my opinion, you can get this look the easiest out of all the bustle periods because you don’t need anything to make your rear look big. If you wish to enhance your rear just a bit…maybe to make it feel more bustle-y or in order to show off the pleats and tucks in the back of your dress better, you have the option of adding a small pillow and there are many options out there for a bustle pillow. Check out all of these on Etsy. They are very easy to make. And a tutorial for making your own bustle pillow. This crafty gal used a crescent shape purse for her DIY bustle pad. Having trains was big in the natural form era. Look for a dress with a flat looking back with gathers and tucks. By this period, nearly everyone had a sewing machine. So, ladies went nuts decorating their dresses with trims. Lots of trim is a great way to express the natural form bustle style. Another style of dress you might like which appeared in the 1870s, is the polonaise style. It was more like the natural form styled dresses by not having much on the rear, except maybe a pillow. These styles were very much inspired by the polonaise styles of the late 18th century (practically 100 years prior). The 18th century influence was seen throughout the 1870s in necklines, sleeves, trims, etc. Recollections has several Victorian bustle dresses ready to buy. We offer many great options for hats you can choose from. Here is a pattern for natural form bonnet hat you can use as a guide. And here is a DIY for a straw bonnet hat from an slightly earlier era. Shop ready made Victorian hats. By 1884, we were now seeing a rather large emphasis on the rear end. I jokingly call this the centaur look. The fronts of the skirts were flatter. Trains were still used for evening. The style lasted until about 1889-90. Late bustle is a bit tricky. But, not much more than early bustle in my opinion. Here are some items you can purchase to get this look. Let’s start with a bustle cage to support your skirts. A search for lobster tail bustle on Etsy will get you many suitable options like this one. I’m sure you can see why this style of the 1880s bustle is called the lobster tail. I made mine in red as a play on that name. Debbie also found her bustle on etsy.com Its just a tubular pillow with ties to the waist and thighs. Under all those bustle layers it works quite well. For the late bustle years, you are going to most likely want a smooth tailored looking style dress. They got less fussy during this period. If you chose a big bustle cage, be sure your dress will fit over it. If you end up with a train, it’ll be ok. These polonaise bustle dresses could work too with the right under garments. Hats in the late bustle years got tall and more tailored looking just as the clothing did. Here is a pattern for late bustle hats you can use as inspiration when hat shopping. The look of men’s tailoring in the Victorian era began to take influence on women’s clothing and accessories during these year. Since there are plenty of lists for bustle era patterns out there, in this article, I will list patterns you can use to make your own bustle that you might be able to purchase at JoAnn, Hancock, or even Wal-Mart. Be careful when purchasing a pattern from one of the Big 4 (Simplicity, Butterick, McCalls, Burda), as not all of them will produce an accurate period look for you. Here are my suggestions based on patterns I have in my stash. The first one is of patterns you could use to make yourself general Victorian era undergarments. These under garments can be used for many of the Victorian era fashions. They include corset, chemise, drawers, and petticoat, options. These patterns are examples of general Victorian era under garments to be made. Next, I have a lovely bustle pattern that would be best suited for the 1880s late bustle era. You will only need the appropriate type of bustle cage and hat to set this dress into the proper era. Be mindful of back skirt lengths when making bustle dresses. Just be sure they fall at least at your ankle and look closely even to the front. This particular bustle pattern, I believe, would be best for late bustle or 1880s. And finally, I have a pattern that with appropriate undergarments, can span throughout all the bustle years. It comes with a sleeveless option, which is most appropriate for evening. 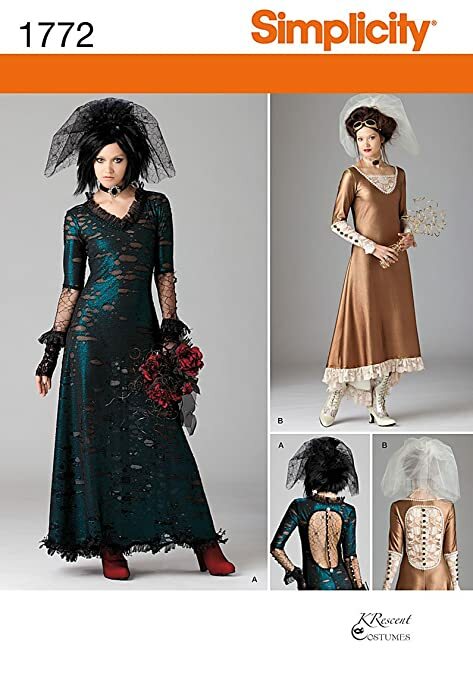 Just combine these dresses with the appropriate bustle era specific undergarments and you’re good to go! Again, pay special attention to the length of the back skirt pieces when making these or any bustle era skirts. I believe this one would be great for any of the bustle years, as long as the sleeveless option is left for evening only.